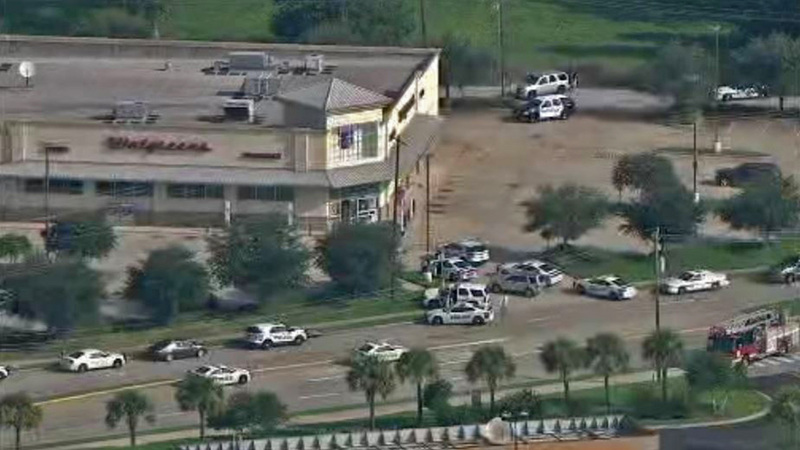 KEMAH, TX (KTRK) -- Customers and employees were going into businesses at FM 518 and Highway 146 in Kemah when a chase went right by them just before 9am Tuesday. "I saw it but didn't know who or what it is, just fast," said Teresa Lee, who was going to work at a nearby nail salon. Police say Bryan Winslow Phillips, 30, was driving a stolen SUV and led police to a Kemah Walgreens when he crashed in front and fired his gun at patrol officers as he ran inside. Just a few customers and employees were there but Rick Berg's wife was one of them. "It was pretty frightening. It's hard to say what goes on in somebody's head," said Berg. League City police officers say an armed suspect barricaded himself inside a Walgreens in Kemah. Phillips is no stranger to police. Texas City detectives say on Monday he was involved in a confrontation involving guns with Derek Zagone, and shot the man once in the chest, killing him. They were looking into the possibility the killing was self-defense. Phillips is also accused of robbing an urgent care of medications in League City early Tuesday morning before carjacking a man and leading police on a chase. "Our officers were still in the area and they located that stolen vehicle. The suspect led us in a pursuit which ended in Walgreens in Kemah," said League City Police Officer Reagan Pena. SWAT officers watched Phillips' movements through the camera system at Walgreens and negotiators talked with him. He released three people first, then finally allowed the pharmacist to leave before he was seen taking some pills and killing himself.